Today I have for you some swirled french tip nails. The base colour is NYC In A New York Color Minute Quick Dry Nailpolish – Prince Street. It’s a really beautiful dark violet/purple. On the nails there are three coats. Unfortunately to get the stunning colour like in the bottle, three coats are needed. White swirled tips are made with acrylic paint. Picture above is taken in warm artificial light when the polish releases tiny pink sparkles. I like this look a lot. It’s not a glittery look, just a little bit of extra shine. 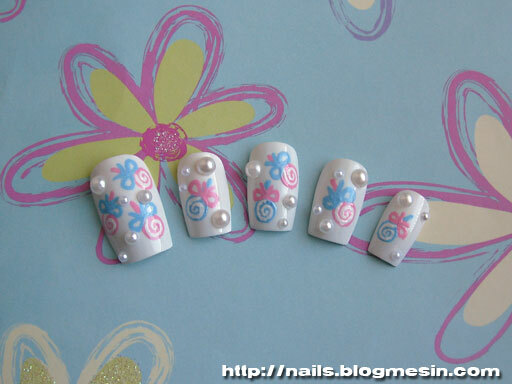 Today I have for you some toe nail design and swatches of a nail polish I used to make it. I used black nail polish under NYC – In A New York Color Minute Quick Dry Nailpolish – East Village. On some of the nails I added shiny dazzlings and painted swirls with white acrylic paint. Over the white paint I added tiny glitter, but unfortunately I cannot see it on the photos. And now the swatches of the NYC – In A New York Color Minute Quick Dry Nailpolish – East Village. In the bottle it has amazing colour, but when I first time painted my nails with it I was totally dissapointed. 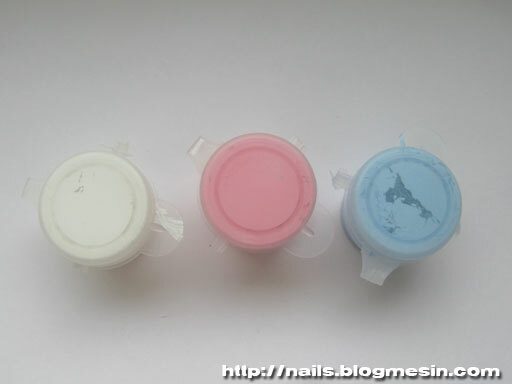 To get the colour similar to the one you see in the bottle you need to apply 3 or 4 coats. It is also difficult to get even coverage because of the thick formula. But if you paint it over the black base you get something amazing! Only one coat of East Village gives the iridescent effect like on the peacock feathers. Depending on the angle of view colour is changing from blue to beautiful glowing green. 2 – two coats of East Village over the black base. 3 – three coats of East Village without colour base. A while ago I bought some acrylic miniatures for nails. 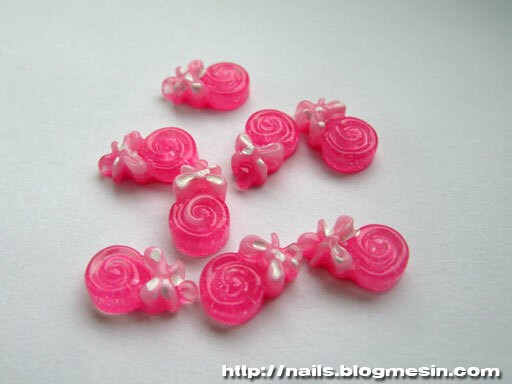 It was a pack of pink swirly lollipops which you can put on nails or any another surface you desire. I like them, but I think that they are a little bit to thick so they will be sticking out from a nail surface. There are probably thousants of ways to use them to make some nice kawaii nails, but I don’t have any good idea (yet). So I decided to paint some lollipops on the nails instead. I used three colours of acrylic paint. White, baby blue and baby pink. First I painted nails with regular white nail polish. Than I painted lollipops with acrylic paint and when the paint was completely dry I added two layers of top coat. Effect was nice, but not nice enough. There was empty spaces, so I added some shiny pearls. I think they go good with kawaii style nails. The lollipops were a little bit clumpy. I am not so good at using acrylic paint, so I guess there was some mistake with painting process 🙂 After applying top coat lollipops looked much smoother. For New Year’s Eve I painted my toe nails like that. I used red nail polish by H&M and Konad stamping plate number m51. I more and more like konad stamps. 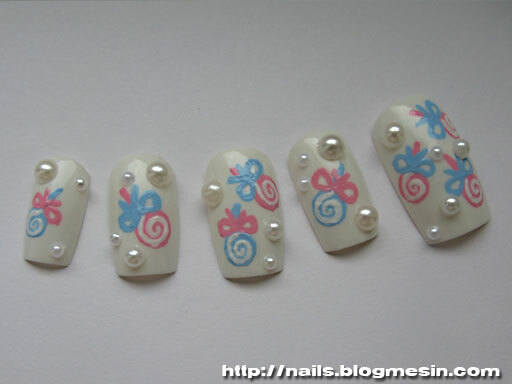 Just couple of minutes and you can enjoy beautifly finished nails. I also love their Top Coat. It shines beautifly and last for very very long.